Which variety of capitalism is best at promoting growth? Like many other residents of the Northeast, Abraham George (MBA '73, PhD '75) has found himself spending a chunk of the year in a warmer climate. But when the fall winds begin to blow, he doesn't repair to a beachfront condo in Florida or a gated community in Arizona. Instead, he spends months at a time in the villages of Southern India, where, in the past 10 years, the software entrepreneur has founded a boarding school, a hospital, a post-graduate journalism school, and a huge banana farm. In between, he led a successful campaign to get the world's second-largest nation to stop using leaded gasoline. For many successful technology executives, selling a company you've spent 25 years building is the culmination of a career. For Abraham George, the sale of his company marked the beginning of a second career – as an ambitious social entrepreneur bent on fighting poverty in his native India. But the 60-year-old New Jersey resident is doing something about it. He’s personally financing a series of efforts in health, education, journalism, and agriculture intended to change lives directly and serve as an example. George contacted Steve Null, with Friends of Lead-Free Children, who had done work on the issue in the Dominican Republic. “My suggestion was to do a small, isolated study in Bangalore to show the scope of the problem, and then use that to lobby local officials to remove lead from gasoline,” Null said. Instead, working with an Indian medical school, the George Foundation carried out blood lead tests on more than 22,000 children and adults in seven cities, the largest such study ever conducted. 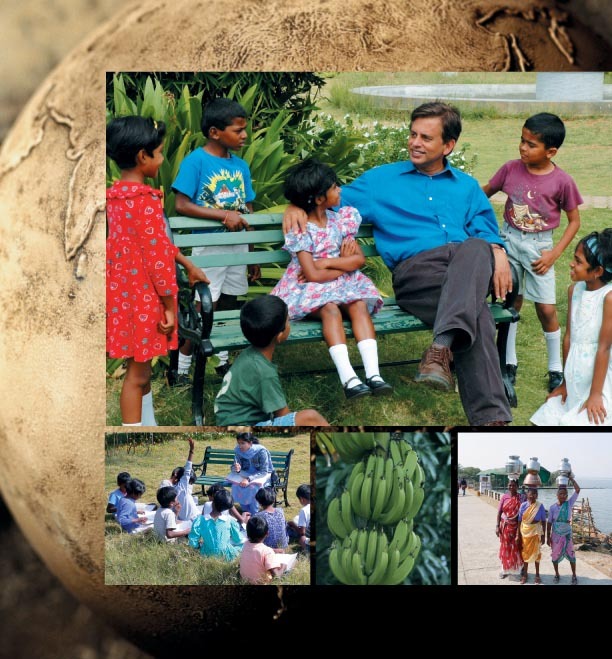 And in February 1999, George put together a conference in Bangalore with the World Bank and other NGOs. The study, which showed that 51 percent of the children in major urban areas had unacceptably high levels of lead, generated a large amount of media interest. In response, India's three major oil refining companies announced that they would offer unleaded petrol within 15 months. Soon after, India's government announced it would ban leaded gasoline altogether – a move that has since been followed by similar actions in Pakistan, Bangladesh, and the Philippines. braham George came from what he describes as a middle-class family, although he had some opportunities that were clearly not available to all middle-class Indians. His parents were both professors. After serving as a captain in the Indian Army, he came to NYU Stern for graduate school. “I had felt a desire to make a difference, and looked to NYU to provide me the basic training and motivation to one day undertake such an endeavor,” he said. He was interested in international development issues and completed both an MBA and PhD in international economics, writing a dissertation on the benefits of a managed foreign exchange rate system. “What impressed me then was his persistence, and a real ability to listen to instructive criticism and incorporate it into his own thinking and activities,” said Robert Hawkins, a retired former vice dean and professor of economics at NYU Stern who advised George. At first, the company, Multinational Computer Models, Inc. (MCM), marketed its products through banks. Eventually, it began selling them directly to companies and added products dealing with interest rates and cash management. By 1990, MCM had expanded to three offices – in New York, New Jersey, and London – and counted some 200 members of the Fortune 500 as customers. That year, First Boston approached George about creating a joint venture in international financial risk management. “Abe was very knowledgeable, and he had a really unique way of looking at foreign exchange that nobody had done,” said C. William Schroth, then a First Boston executive who currently serves on the board of George’s foundation. “And he had a client list that was the best and the brightest of the Fortune 500 using his system.” George agreed, and worked with the bank for five years. So in 1995, George returned to India for the first time in 22 years, and set up a charitable foundation in Bangalore. “What struck me most was the big contrast between what was happening in Bangalore, where multinationals were pouring in and the five-star hotels were filled with rich Indians and foreigners, and hardly an hour away, 80 percent of the people have only one meal to live on, and the caste system placed a good number of them in a socially unjust and degrading situation,” he said. George says he returned to his native country with principles he had learned at NYU Stern and on Wall Street. First: whether you run a non-governmental organization (NGO) or a private company, there is no substitute for good management. And second: people need opportunities, not handouts. “That meant it was incumbent upon me to create opportunities for people to be employed and learn new skills,” said George. That also meant he’d be spending more time in poor Indian villages in the Tamil Nadu region than in boardrooms in New York. In his book, The World is Flat, Thomas Friedman describes a visit to Shanti Bhavan, the school Abraham George built for children. “The word 'wretched' does not even begin to describe the living conditions in the villages around the school. When we eventually reached the school complex, though, we found neatly painted buildings, surrounded by some grass and flowers, a total contrast to the nearby hamlets. The first classroom we walked into had 20 untouchable kids at computers working on Excel and Microsoft Word. Next door, another class was practicing typing on a computer typing program. I loudly asked the teacher who was the fastest typist in the class. She pointed to an 8-year-old girl with a smile that could have melted a glacier…”. 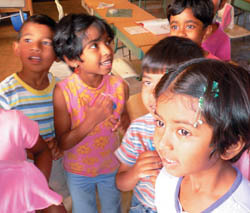 The George Foundation’s first effort was the establishment of a boarding school to serve some of the most disadvantaged Indians: orphans and children of lower-caste families. George believed that giving poor children excellent opportunities and solid educations would enable them not only to rise up, but to act as leaders of their communities. 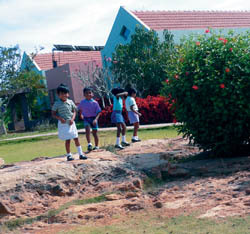 In the summer of 1997, the school, Shanti Bhavan, formally opened with 48 students. Today, it enrolls 220 children and employs 60 individuals. Once the school got up and running, George realized it would be a significant time commitment. “As I got deeper and deeper, I was beginning to spend two to three months at a time in India, and emotionally I was drawn more toward this than the company,” he said. In 1998, he sold MCM to SunGard. George initially stayed on, but resigned in 2000. Freed from his responsibilities, George began to focus more on the root causes of India’s poverty. George quickly learned that health care is a pressing need. “If you’re sick, you can’t learn anything,” he noted. So in 2000, George built the Baldev Medical & Community Centre to demonstrate how essential health education and health care could be delivered by a private-sector organization. The hospital today has a staff of eight who serve some 17,000 people. George also developed a software application that can diagnose common diseases like diarrhea, malaria, and typhoid in the absence of a doctor. The so-called “Doctor in a Box” was tested in India by the Johns Hopkins University School of Public Health and found to be effective. George has founded a company, E-medex Online, to develop the product for use around the world. “We won’t charge more than 10 to 25 cents per patient per year,” he said. The potential market: between 3 and 4 billion people. While NGOs and the state have a role to play, George believes that in the long run, only vibrant private-sector economic activity can lift the 600 million truly poor Indians out of poverty. The IT sector is only one of several industries that he believes will contribute to improvement. “The key is to train people where they have natural abilities, like farming, bring in better technology, and help create assets,” he said. That’s exactly what he’s done in a poor, isolated region outside Bangalore where the George Foundation acquired about 250 acres of land and started a large-scale banana farm. Virtually all of the employees are lower-caste women. 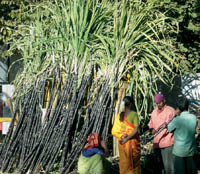 Working with an Israeli company, the Foundation taught the farm’s employees the techniques of drip irrigation and precision fertilizing. 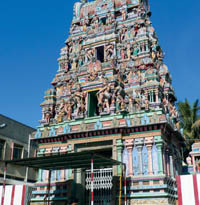 Today, Baldev Farm is the second-largest banana grower in southern India, shipping about 20 tons a day. Profits from the farm support the hospital, but also go into a fund to allow employees to purchase land. “The dual goals are to economically empower the women so their social status can improve and also own permanent income-generating assets,” he said. Abraham George credits NYU Stern with giving him the tools needed to succeed as a software entrepreneur on Wall Street, and as a social entrepreneur in India. But his connection with New York University goes much deeper. Both his parents taught at New York University, his mother, Aleyamma, as a post-doctoral fellow in physics, his father, Mathew, as a Fulbright Fellow in law. George's son, Vivek, graduated from NYU with a bachelor's degree in economics. And his brother, Bijoy, and two sisters, Lekha and Vinita, also studied at NYU in economics and English at the master's level. hrough such efforts, George is aiming to prove that profits and poverty reduction can’t just co-exist, but that they’re vital to one another. “He’s combining entrepreneurial risk-taking and attitudes in an economic development context,” said Professor Hawkins, who now serves on the board of the George Foundation. 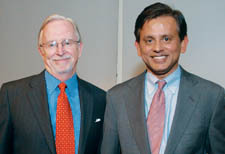 Dean Thomas Cooley (left) and Abraham George at a Stern event held in the spring. George spoke to nearly 50 MBA students from the South Asian Business Association at Stern (SABAS) and Social Enterprise Association (SEA) about his views on India's development and how to bridge the gap between the world's rich and poor. He’s working with Stern to arrange a conference this fall to invite corporate leaders in industries that can operate in rural sectors – from agriculture to textiles – to learn more. Recognizing that corruption and poor governance are a problem, George felt that the Indian press wasn’t doing a particularly good job exercising oversight. “So I thought the best thing I could do was to train some young people in the principles of journalism,” said George. And so in 2000, he established a school about 15 miles outside of Bangalore that provides a one-year graduate degree in journalism. It graduates about three dozen students per year. “It will take a long time, but we have to start somewhere,” he said. Abraham George is aware that he’s only one person and has his limits. While his energy seems boundless, his resources are not. He has put in some $17 million of his own funds and is now appealing for outside assistance. (Individuals currently account for approximately 10 to 15 percent of the Foundation’s annual budget of about $2 million.) While the return on this investment has been “exceedingly high,” he can’t do it indefinitely. “If I don’t get anybody to help me, I’ll have to scale back my activities.” Both his sons are actively involved in the Foundation on a part-time basis, and his entire family helps out in many ways. Thomas Friedman asks for 100 Abraham Georges. Given India’s scale, many more are needed. Right now, there’s only one. But in the space of a few years, he has demonstrated the ability of a single person to affect change on a large scale. Daniel Gross is the editor of STERNbusiness.